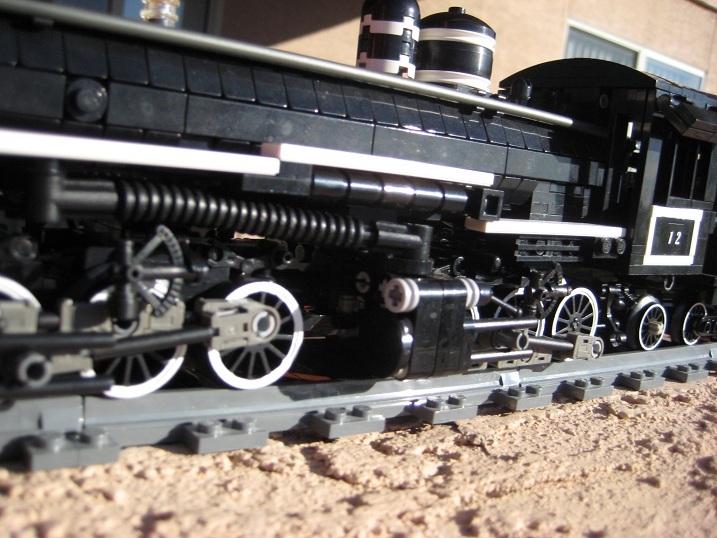 I recently received a commission to design and build an EMD FP7, based off the pair running on the Verde Canyon Railway. Given the somewhat similar shaping and design between the FP7 and the E7 I’ve had in my design queue, it was a good opportunity to test run a few of my design concepts for how I was going to build the bulldog nose of the locomotive. Between that and the fact that the Verde Canyon engines have a rather prominent eagle pattern on the sides, this commission turn out to be a very fun and enjoyable process. So far I’ve only proceeded as far as the digital phase, but I have taken the opportunity to create a high-quality render of the two engines as a pair. 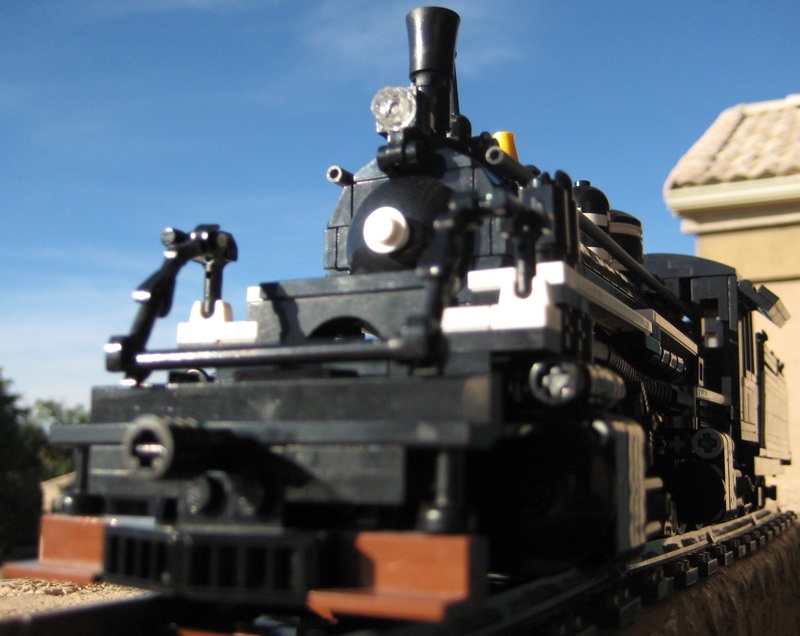 The real Verde Valley engines are a different, very interesting sort of blue. Depending on the angle and lighting, they can change from almost a dark teal to a sky blue, and in some cases a blue very similar to the one here. Due to the limitations of parts and colours available, standard blue filled in. Building the eagle on the side into the design with the bricks has been a fun challenge as well, trying to find a good design that matches closely the spirit of the original without being too blocky. The monotone brown for the wings will have a better colour variance in reality, which should very much help with the wing pattern. Although they look nearly identical, there are two designs here. 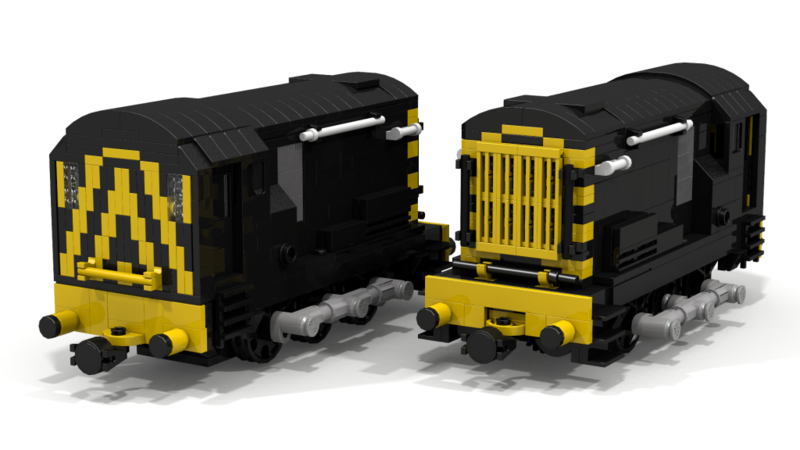 The one on the right is the standard unit, and the one on the left has been slightly altered to accommodate a full serving of LEGO Power Functions equipment, with two motor bogies on the bottom. I will updated again as the project progresses! Does this engine look familiar? It should! 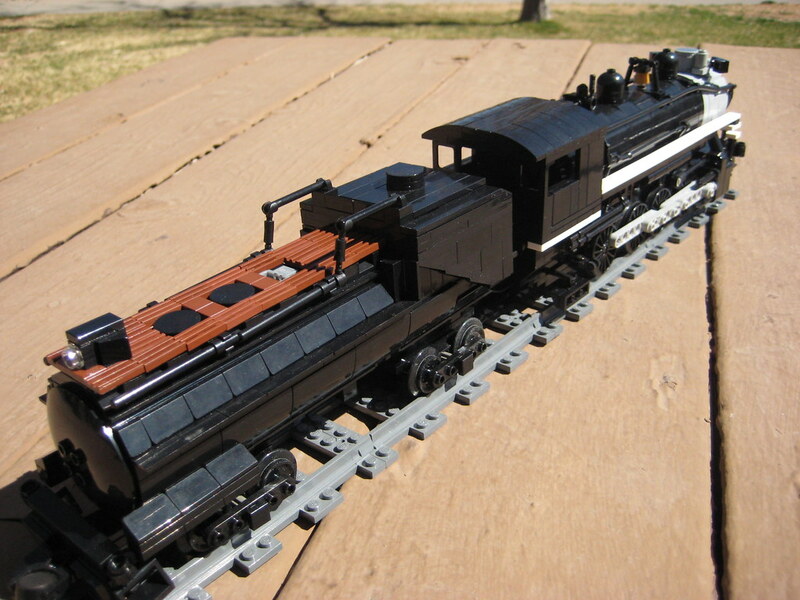 This model is based off of the same engine as my other 2-6-6-2, except way back in time. As noted on my other engine’s post, Southwest Lumber Industries Engine #12 started life originally as a 2-6-6-2t articulate tank engine, the Hammond Lumber Company #6. I was extremely fascinated to find out that #12 started it’s life as a tank engine, and the chance to build a “Younger” version of #12 was too fun too pass up. Unfortunately, I could not find any photographs of #6, and was only able to find one drawing of it. Originally Olive Green and Platinum in colour, it certainly carried a fresh and stylish look to it. Sadly, LEGO has just this year started producing an Olive Green colour and the parts are very limited. For the design phase I’ve so far kept the black-with-white-trim livery it carries in it’s modern day incarnation, however the chance to have a bright locomotive may win out. Before I start on it’s physical construction, I will likely look into building it in LEGO’s standard shade of green. It will be a little too bright, but it will do until such a time as Olive becomes possible. Given that I had already worked all the kinks out of the design of #12, I did not foresee a lot of work being needed to create #6. And, while the running gear did not change, the addition of the oil bunker and water tanks made this design a whole new beast. However, I am confident that the transition into brick will be very smooth, and am looking forward to constructing it. Currently WIP, In Digital Design Phase!! Although I’m an American, I have always absolutely loved small British engines and have a lot of fun building them. One of the engines on my list to design and build was a British diesel, the BR-08. Although diesels aren’t generally as appealing to me, the BR-08 is an engine I couldn’t really resist. Though small, stubby, and boxy, it has an iconic look to it and the drive rods help add that visible motive flair that so intrigues me. 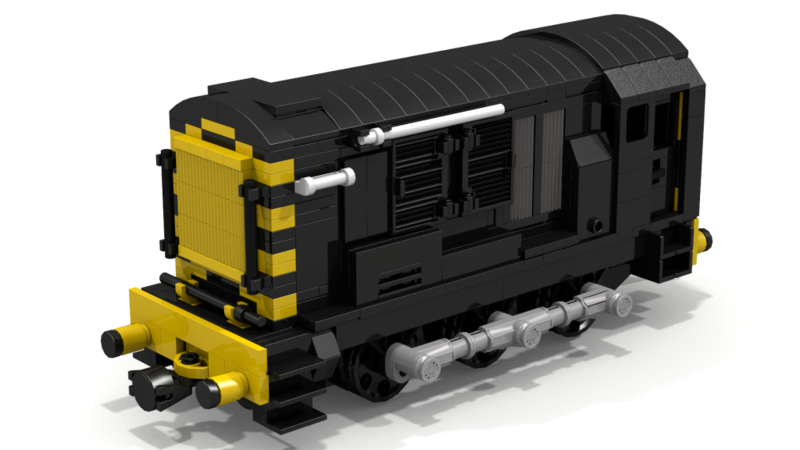 And as far as my LEGO railway goes, having a small nimble shunter that would be able to fit all the LEGO Power Functions elements was a definite draw. This engine has been in my design phase on and off since probably October 2012, and I keep tweaking it sporadically. 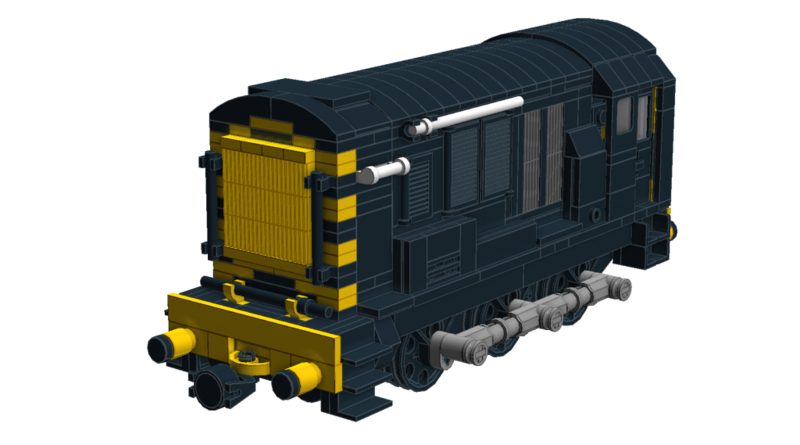 This WIP post will continue to be expanded as I go, and after having 2 steamers cut in line the BR-08 is finally my next engine to build “In the brick”. This image was made using LDDtoPOVray converter, letting me make a higher quality rendering of my Lego Digital Designer model. This was my first version of the BR-08, and it has been changed somewhat significantly. Sadly, there is no good way to get the drive rods on the wheels as slim as the real engine without modifying some parts, but I do intend to build this engine with some of Benn Coifman’s custom drive rods. In the end, I was unsatisfied with this version for the lack of real texture or detail on the sides. The real engine has several maintenance hatches along the front, and in trying to put those in I came to the conclusion that as designed here, the engine was simply too stubby. It was an OK start, but it needed to be stepped up a couple notches. This was the next version to roll out of the works, 2 studs longer and with the access panels. Definitely a step in the right direction, but the parts used for the access panels turned out to not exist in black, and furthermore, the arrangement still did not satisfy. A majority of the engine was redesigned, including the front grill and the sides. As and added bonus (And sadly, not super visible here), I managed to fit on the last of the outer triangle frames thanks to the added length. I have not yet made a high-quality render of this version, however, the access panels are finally acceptable to me and fully viable. 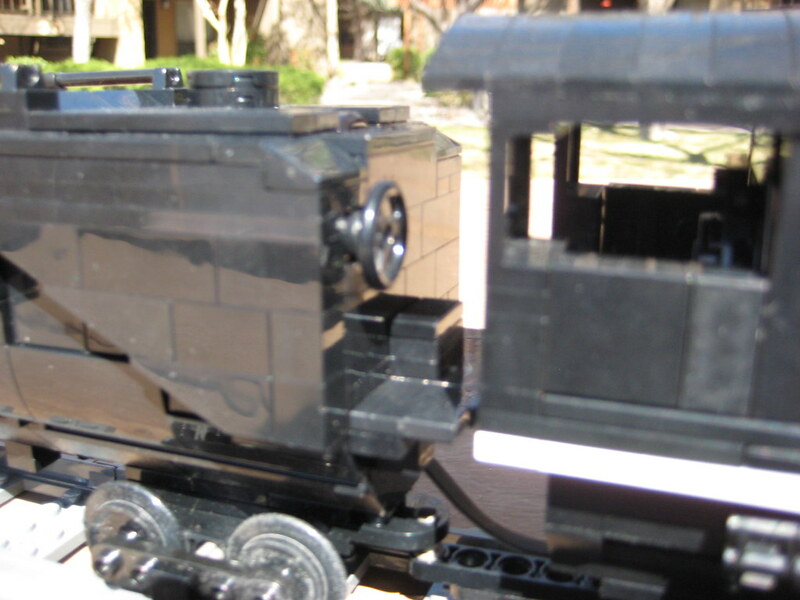 The technic spoke wheels visible here will be replaced with BigBenBrick’s Medium Drivers, and the engine manages to fit all the required Power Functions elements, with the motive power provided by an M-Motor. I may change out the ladders/steps on the front and rear to be a little more uniform and slim, but the overall design looks good and I’m excited to work with the eventual final model and see it in motion. 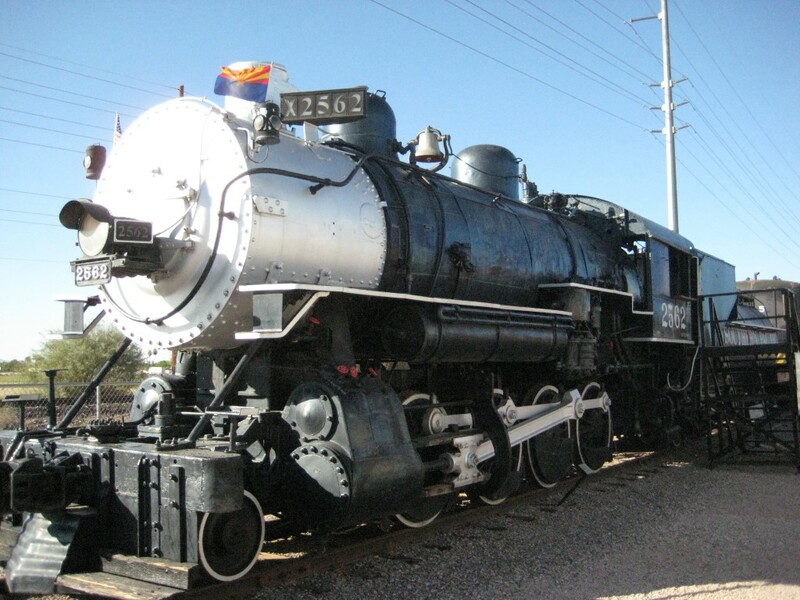 Engine #12′s real life counterpart resides at the Pioneer Museum in Flagstaff, Arizona. 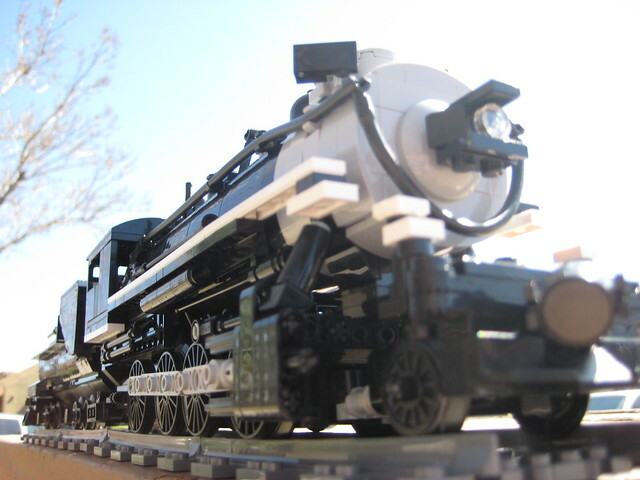 It was built by Baldwin Locomotive Works as Engine #6 in 1929 for the Hammond Lumber Co. as a tank engine, before being converted to a tender engine around 20 years later while owned by the Southwest Lumber Mills. It was donated to Coconino Park (Also in Flagstaff) until the mid-nineties when it was moved to the Pioneer Museum. And what a beautiful engine it is. With a 2-6-6-2 “Mallet” wheelbase, it immediately caught my attention. Working with such a long wheelbase on the engine was tricky, as I wanted it to be able to navigate the tight curves of L-Gauge track. Here’s a close up of the wheels and running gear on the left side of the engine. The Walschaerts Valve gear on this engine is static, sadly, as there was very little room to try and fit in all the need components, and certain aspects of that particular style of valve gear can get bulky in LEGO. This picture brings up a good chance to talk about the steam pipes feeding the rear pistons. If you look at the reference picture above, these are actually a little too big in diameter; however due to the limited sizes of LEGO hose I chose this style so that they wouldn’t get lost among the other hoses and handrails. 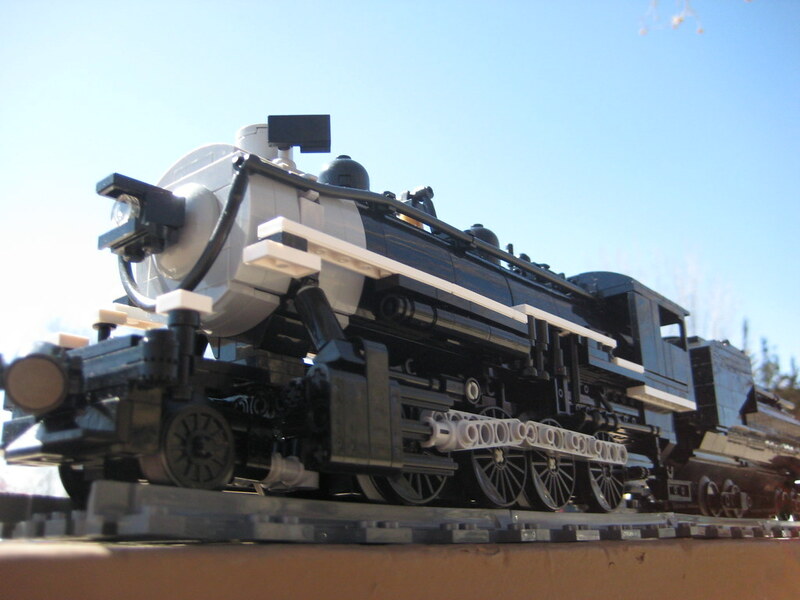 This engine model is around 1200 bricks, and uses BigBenBricks custom Medium Drivers. In these pictures, the connecting rods are made using the old LEGO flex cable system, these however have recently been swapped out for some custom drive rods by Benn Coifman. Design started in February 2012, and most of the design work was done in 3 months, with a lot more work on the running gear and assorted details being worked out over the next 6 months. 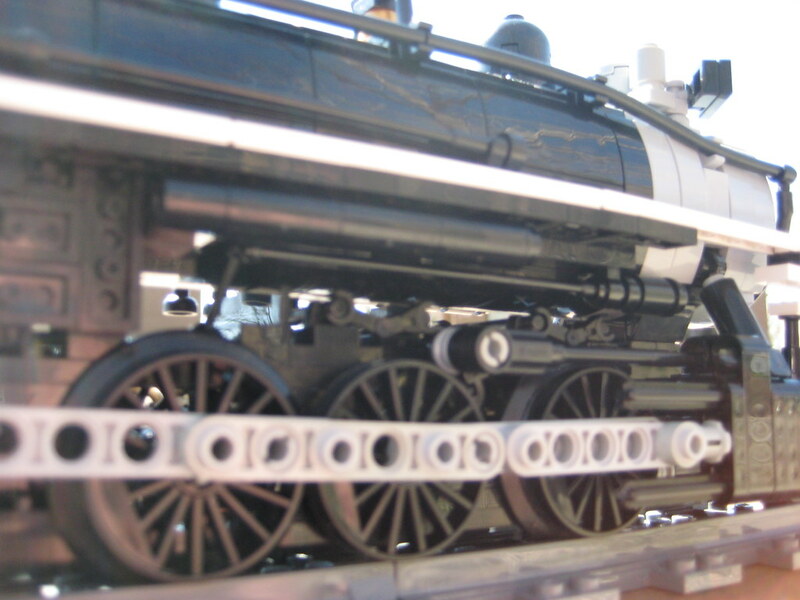 Being an articulated Mallet engine provided a lot of challenges, and getting it to run smoothly was particularly challenging. In the end, though, this is probably still my favorite engine in my collection, and can navigate any of LEGO’s tight turns and switches easily. The small size of the engine made me quickly decide that I was not going to be able to power it without some serious sacrifice in detail, and therefor I turned to powering the tender. 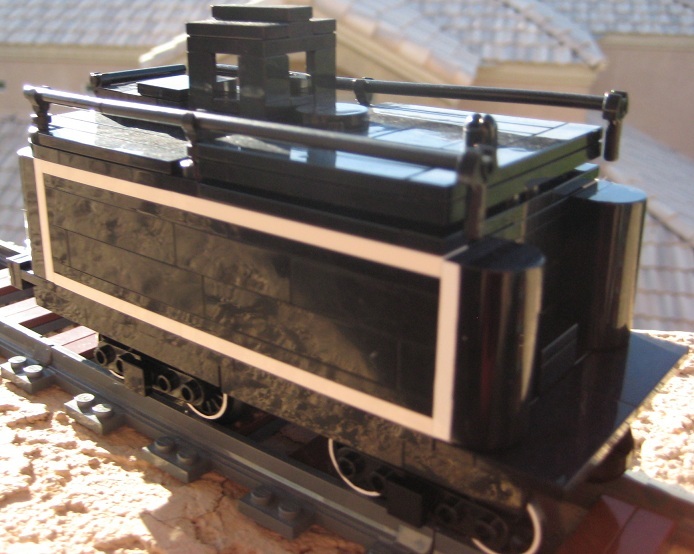 The tender is designed to be relatively easy to convert to using LEGO’s Power Functions or 9v system, although that requires the bogies of the tender and the trailing truck of the engine itself to be swapped out. 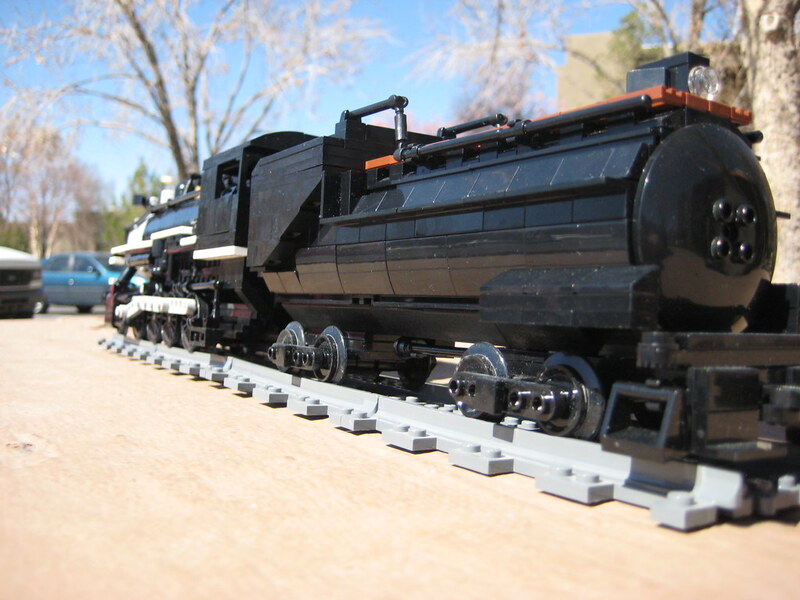 This engine has been run at the Phoenix Comicon 2013 as a part of the CactusBrick display, and it ran without problems the entire show being pushed by a powered baggage car. It handles curves very well at all speeds, and the two sets of drivers make it very fun to watch. Welcome Trains by Chris! This website is currently in the very early stages of production, but will eventually be a good archive of the steam engines (And occasional diesel) that I build. Keep checking back over the next few weeks, as the site will continue to grow and be updated. The first priority will be to put up pages for each engine, but eventually I will start adding rail history and information on each engine I build. There will be work in progress pictures and posts, and eventually I will work on enabling commissions. Even further down the line, I’d also like to add the ability to buy building instructions; however those are very tedious work and even simple ones take a long time to make. Thank you for stopping by, and please come again!